6,200 cfs on the Toutle River and dropping, 9 paddlers put on Hoffstadt Creek at 1pm and ran out of daylight 30 minutes to early. I think it’s safe to say that everyone had there own mini epic in there today. There was some new wood which required more portaging than previous trips and I haven’t been that happy to be off a creek in a long time. Near the take-out the light faded away leaving us to deal with a couple log portages and a class 4 boulder garden to read and run in the dark. One after another, more paddlers came down extremely excited to be at the take-out. A new year brings new adventures and great change! Most of the local rivers and creeks have changed due to the heavy snow weighing down the trees and sending then into the water. Surprisingly Hoffstadt Creek was still a great adventure despite the difficult winter conditions. A large crew consisting of boaters from Portland, Seattle area, and the Gorge put on late and enjoyed everything Hoffstadt had to offer at a med. flow. There were trees blocking the entrance to Gnargasim and three other log portages, other than that, everything else was good to go. 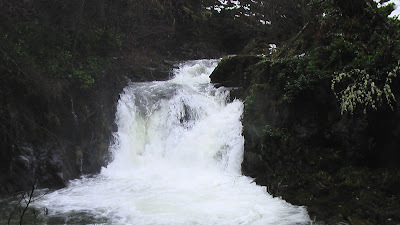 The flow on the Toutle River was around 9,000cfs and dropping with lots of snow. 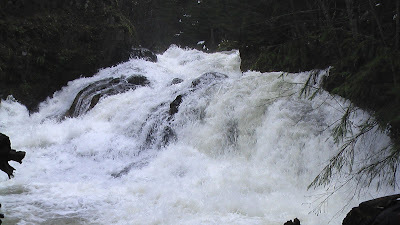 6,300cfs on the Toutle gauge and an almost perfect flow on Hoffstadt. The day went very smooth for an exploratory run. We hiked in with a few inches of snow on the ground, scouted and ran many quality rapids, had our fair share of portages, and made the grueling hike out before dark. According to those who had been there before the crux move on this run was suppose to be getting into the eddy above Gnargasm and on this day it was sketchy at best! We all took out way above this drop and portaged down to it on river left to avoid the must make or get mangled line to reach the eddy. The eddy was a one boat moving eddy with a guardian rock just behind the eddy line, so even if you did make it to the eddy, you still might get rejected by the guardian rock. Needless to say, check out your next move carefully before proceeding downstream on this creek until you get past Gnargasm. I only took these two photos from our trip, but there were many many more rapids in there.